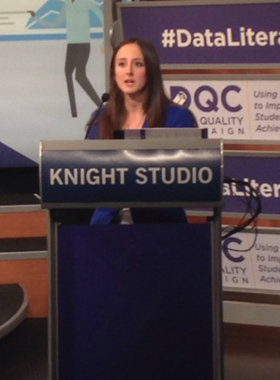 The Data Quality Campaign assembles educators in Washington, D.C., for a discussion on how educators can use data in the classroom. In some teaching circles, “data” has become an ugly word — equivalent to test scores and teacher evaluations, which at times come across as more hurtful than helpful. “Imagine the teacher who sees data as a hammer. These teachers view data as a negative thing because it's being used to hurt them,” says Aimee Rogstad Guidera, executive director of the Data Quality Campaign, a nonprofit advocacy group committed to promoting the use of data in K–12 education. But armed with data to intervene, adjust lesson plans and help students succeed, there’s no reason that teachers can’t feel empowered with data, provided they’re given the resources, support and training to do so. This was the general theme that ran throughout the discussions and presentations at the Data Quality Campaign’s “Empowering Teachers with Data: Policies and Practices to Promote Educator Data Literacy” national event at the Newseum in Washington, D.C. The event, which brought together state and federal policymakers and educators, coincides with the release of the organization’s new policy brief, “Teacher Data Literacy: It’s About Time.” The brief outlines recommendations to promote the use of data by teachers and ensure that it’s easily accessible. Delaware Secretary of Education Mark Murphy has been a champion of data in K–12 schools. His state is one of the few to meet all of the DQC’s 10 actions to ensure effective data use. Murphy, who was the keynote speaker at the DQC event, wove a detailed story about the experiences and testimonies of students he’s come across in his work as secretary of education in Delaware. He started with John: a fictional name for a student who had a great middle school career and was moving on to the ninth grade. While John managed to make it through ninth grade successfully, some of his friends weren’t so fortunate. By tenth grade, John had completed his final state test and had taken his PSAT. His score on the PSAT wasn’t great, but he consistently received A’s and B’s on his report card. By his senior year, John decided to enroll in an AP course. In November of his senior year, however, things started to fall apart. His SAT scores weren’t up to snuff, and he was struggling in his AP course. Ultimately, he wound up settling for community college for his first year in higher education; but in August 2013, frustrated, John decided to quit college. This story underscores some key data points that Delaware has discovered about its students. According to Delaware’s data, the 9th grade is a critical year in student development, as only 30 percent of students end up making it to a second year of higher education. “Have we built the systems to link K–12 with higher ed?” Murphy asks. The data suggests otherwise. Three components must underpin every state’s approach to fostering data in education: infrastructure, honesty and empowerment. But the real people who are tasked with doing meaningful work with data are in the school level, Murphy says. “The state is not actually the one that's going to help John tomorrow. The answers live within the people closest to our children. Those are the people we have got to unleash. Build their data literacy, empower them, orient them toward solutions,” he says. In a world where Common Core Standards must be implemented alongside flipped classrooms, digital curricula and classroom technology integration, teachers have a lot to juggle these days. “We are at a point in time where we are expecting from our students more than ever before, and that goes hand in hand with expecting more from our teachers than ever before. It's a hard job that's getting harder,” says Sandi Jacobs, vice president and managing director of state policy for the National Council on Teacher Quality. The challenges teachers face in receiving training, resources and support around gathering data, analyzing data and acting on data is something that many states and school districts have yet to figure out. Teachers need access to valid and reliable data and time to analyze and understand the data, says Adriane Dorrington, a senior policy analyst for the National Education Association. The definitions around data and data literacy also need to expand. There tends to be an equivalency of data with numbers. But observational data and anecdotal data must also be factored in to provide a complete picture of student achievement. Jennifer George (right), a fourth-grade teacher at Maury Elementary School in Washington, D.C., says informal assessments such as reading groups were essential to her success with becoming data literate. DCPS actually provides its teacher with interim reports, which give them the necessary infrastructure to assess student performance. “Teachers are able to use data this way without being involved with the process of collecting and analyzing the data all alone,” George says. Thanks to DCPS interim reports and her own informal assessments, George was able to intervene to help a student, scoring in the 60 percent range in math, improve and score 90 percent on subsequent math assignments. This success story with data reinforces DQC’s belief that a data revolution in K–12 education is right around the corner. Teachers need to be trained and armed with the right data ammunition. “We've been throwing individual data points at teachers when, instead, we need to give them the time, space and tools to have a different perspective to be able to create that big picture,” says Guidera.